Description: In the beginning, the Grote church of Zwolle, also called St. Michaels church, had three organs: two small instruments and a larger one. The first note about the main organ, dates from 1505. At that time, Johannes Jacobsz van Bilsteyn from Rhenen built a large organ with 3 manuals and pedal: the Hoofdwerk (Great) was constructed as Blokwerk, with all 32 up to 34 voices sounding at the same time, the Bovenwerk (Echo) with 4 or 5 voices and the Rugpositief (Positiv) with 4 voices. In 1643, Jan Morlet III from Arnhem modernized this organ and made the basic voices of the Blokwerk playable on the Pedals. In 1669, the tower of St. Michaels (which at 128 meters was the tallest in the Netherlands) burnt down after being struck by lightning, also partly destroying the main organ. Because lack of finances for costly repair, the organ was disassembled and stored. For more than 30 years, the congregation worshipped without an organ, until in 1718 Bernard Hüte, physician and town mayor of Zwolle donated 12.000 guilders for the construction of a new organ. His brother Thomas added another 2.000 guilders. At that time, a Zwolle merchant, in Hamburg on bussiness, met Vincent Lübeck, organist at St. Nicolai, Hamburg, who recommended Arp Schnitger to the Zwolle authorities as builder for the new organ. This resulted in the assignment to construct a new organ in Zwolle. On January 3, 1719, Arp Schnitger signed a contract to make an organ with 46 stops, consisting of Ober Manual (16 feet based), Unter Manual (8 feet based), Rückpositiv (8 feet based) and Pedal (16 feet based). The agreed price was 11.000 guilders, on the condition that the city of Zwolle would deliver the needed materials of stone, wood and iron. The unused Catholic church in Zwolle was given to Arp Schnitger and his sons Frans Caspar Schnitger and Johann Georg Schnitger as a workshop for the construction. Because Arp Schnitger died in 1719, some months after the beginning of the construction, his sons completed the new organ in 1721. It was examined by three well known Dutch organists over the course of 12 days and they found that the Schnitgers had delivered an organ of 63 stops (whereas the contract of 1719 called for only 46 and the second contract called for a fourth manual as a Borstwerk with 11 extra stops), in addition to other improvements. In their report, they were full of praise for the organ, but they also passed some criticism. Some of the voices were not strong enough and others had not been modeled after the best ones in certain other Dutch organs. They also objected to the pitch and temperament with regard to using the organ with other instruments. 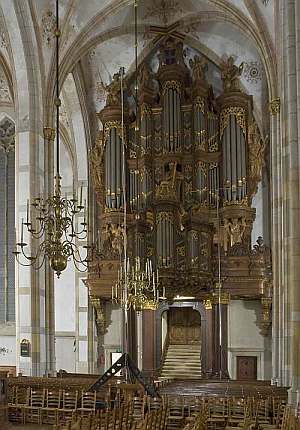 The Schnitgers had tuned the organ to "chorton", but the examiners asserted that a lower pitch was in general use in the Netherlands. In their letter of October 6, 1721, the brothers Schnitger refuted this criticism, resulting in the cancellation of proposed modifications. Up to his death, in 1729, Frans Caspar Schnitger took care for the maintenance of the instrument. This task was taken over by Albertus Anthoni Hinsz, the successor in the family undertaking, who married the widow of Schnitger. His stepson Frans Caspar assisted him and later on Heinrich Hermann Freytag and his son Herman Eberhard also. Over the course of time the organ experienced numerous detrimental modifications. Especially notable are the extensive restoration and modifications, carried out in 1837 by Petrus van Oeckelen (Groningen), including changing the organ to equal temperament. Later on modifications were carried out by J.C. Scheuer (Zwolle) in 1873, van Oeckelen in 1883 (including the deplorable alteration of most mixture and some reed stops), J. Proper in 1910 and Van Dam in 1925. After the Second World War, a comprehensive renovation turned out to be indispensable. After many discussions it was decided to return the organ very close to the original situation in 1721, recovering also the original high pitch ( a’= 502 Hz). In 1950, organ builder Dirk Andries Flentrop (Zaandam), was charged with this task, which he carried out in the period 1953-1955. It appeared that the chaos of pipes over centuries, made by different organ builders, still contained sufficient original material to reconstruct the original Schnitgerian scales. The restoration plan included repairing of the pipe work, attaching new ivory on the keys and the construction of new pedals. Although some later introduced modifications remained preserved, the disposition of Schnitger was restored as good as possible by using the original materials, and, if necessary, also by new pipes made by Flentrop. Given the Neo-Baroque ideals at that time frame, the restoration has been carried out very conscientious. But later on ideas about the ideal organ sound changed and knowledge about restoration of organs improved. Therefore, Flentrop, in the last two decades carried out a series of additional voicing corrections, in order to arrive more closely to the authentic starting point. Especially, lowering the wind pressure to approx. 78 mm and the voicing corrections based on this value had beneficial effect on the timbre of the organ.